Meet our natural treats for dogs. 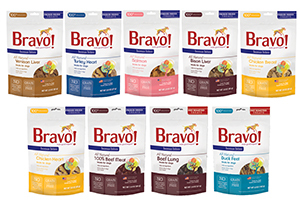 Bravo offers a wide variety of wholesome, natural single protein canine treats, from our line of full-sized, dry roasted and freeze dried single protein treats to our bite-sized Training Treats. Like our raw diets, our treats share some important advantages...100% meat, poultry or seafood is always the ONLY ingredient - no added filers, preservatives, addtovoes or flavors. The poultry treats are NAE (No antibiotics EVER made from poultry fed a vegetarian diet, given open pasture access, And certified humanely raised. We use Grass fed New Zealand lamb and venison, which is also grass-fed and raised in open pastures. They are all natural, grain and gluten free and USA Made in our plant. Alongside our main meal frozen and freeze dried diets, they offer you the option to feed treats just as healthy as your pet's main meal. They complete out commitment to making healthy happen. Treats should not make up more than 10% of your dog’s diet. For smaller or less active dogs, tailor your treating accordingly. Instead of praising good behavior with one large reward, train frequently with smaller, lower calorie treats. Use treats to stimulate your pet’s thinking and encourage more physical exercise. Consider feeding hard, crunchy treats or bones that help oral health by scrubbing plaque and tartar away. Consider feeding your pet all-natural, single protein treats instead of high fat, low nutrition snacks. Ask your veterinarian for treat feeding advice pertaining to your particular pet. Always supervise your dog when feeding treats, bones or chews.